Ever dream of swimming amongst the beautiful, unusual and exciting creatures of the undersea world or becoming the captain of a boat transporting people and cargo around the world? One of these scholarships/training grants can help you achieve that dream! Don’t let this opportunity pass you buy! 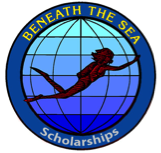 Check out the scholarships/training grants webpage on http://www.beneaththesea.org/scholarships/67324. Also check out the link to the Scholarship Honor Society on that webpage and read about our past scholarship recipients. Maybe someday you will be a member of the Scholarship Honor Society! While on the website, visit our other educational & exploration initiatives for Kindergarten through adult. Marine Careers annual one-day free program (Friday, March 29, 2019) for high school, college age students and young adults. School groups and individuals are encouraged to attend. Register online now. Ocean Pals Art-In-Education Poster Contest and Imaging (Photo) Contest for Kindergarten through 12th grade (entry deadline is December 22, 2018). This year’s theme is: Magical Manatee. School groups and individuals are encouraged to enter. International Imaging Competition (entry deadline is December 31, 2018). Entries may include photos and videos in categories: General/Marine Life, Green/Cold Water, Macro Close-Up, Underwater Behavior and Conservation. Beneath The Sea®, Inc., celebrating 43 years, is recognized internationally as a source of education about the ocean environment To learn more about these educational & exploration opportunities go to: www.BeneathTheSea.org.